“L’uomo non vive di solo pane / Man does not live by bread alone” … but this certainly doesn’t seem to apply in Tuscany. For centuries Tuscan bread has been a staple for the poor. The Tuscan bread recipe is salt-free, therefore called in Italian “pane sciapo”. In fact, its taste goes well with traditional Tuscan cuisine rich in salt and abundant flavors. It has a crispy reddish crust, while the interior is soft, but not spongy . It is a perfect base for delicious appetizers or “stuzzichini”. 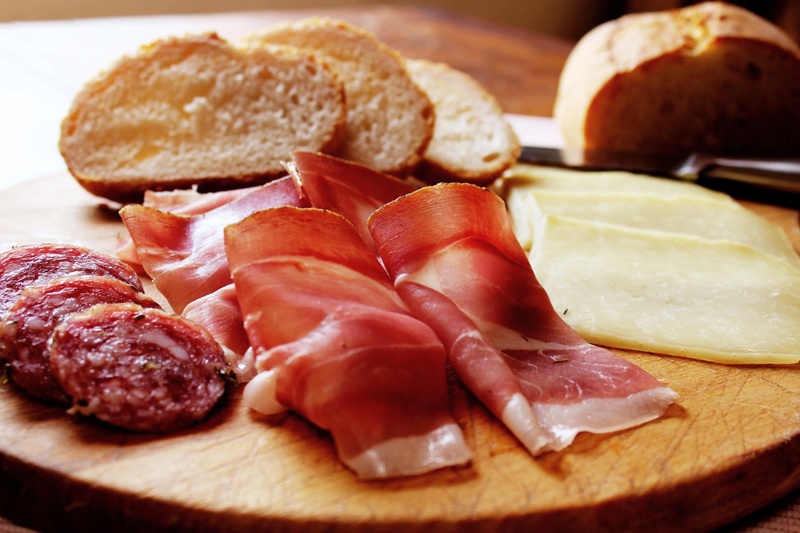 It can be served with tasty cured meat products, “affettato”, such as Tuscan Prosciutto Crudo, salami (fennel-flavored finocchiona) or Tuscan pecorino cheese, and it is one of the most appetizing ways to start a meal. It can also accompany savory soups such as “ribollita” and “pappa al pomodoro”. It can also be used for the typical “panzanella”, a bread and tomato salad. Moreover it is very palatable in the form of crouton slices, thin pieces of grilled or fried bread. The croutons are very good with chicken liver pate’, olive paste, or as the base of the famous “bruschetta” with olive oil, garlic, tomatoes and fresh basil. The lack of salt has historical roots: around the twelfth century, because of the struggle between the cities of Pisa and Florence, the maritime republic stopped the salt trade to the countryside, and because of this the farmers had to prepare their bread without salt. Today, this tradition is generally maintained, although nowadays in some areas of Tuscany bread is lightly salted. You can add a small amount of salt (about 5 g (1 tsp) for 500 g of flour, 3 cups), according to your taste and to match the food you are eating. 6. Put the dough in a glass bowl and let rise for about 20 min. Cover with a cotton towel. Let rise in a warm draft-free place at a temperature of approximately 30°C or 85°F. 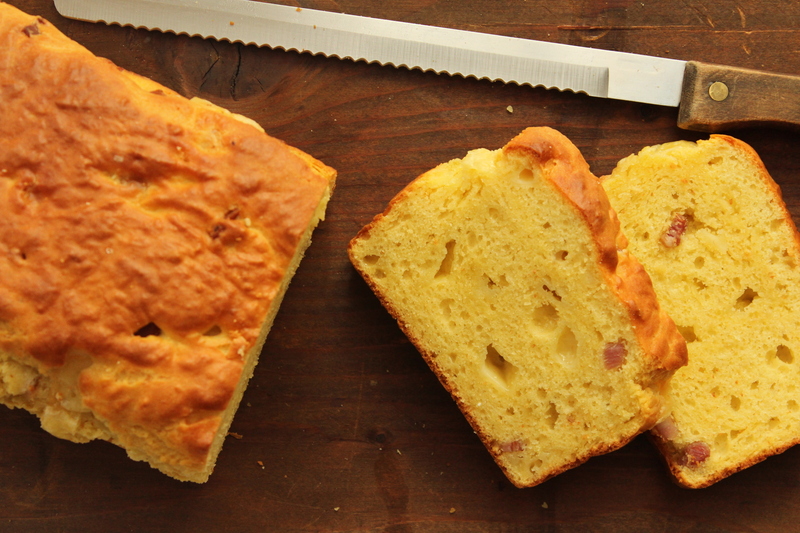 This delicious bread, soft and tasty, and flavored with bacon and cheese, originates from the regions of Tuscany and Umbria in central Italy. The bread is simple and quick to prepare and is a suitable recipe to accompany a cocktail, a salad, or a picnic. Preparation time: 55 min. Baking time: 50 min. 7. Bake for 50 min. Let the bread cool in the pan for 5 min. on a rack, then remove it from the pan and let it cool on the rack or about 15 more minutes.